This school unlike other central schools in Surrey but following the L.C.C. pattern had selective entry by examination for pupils in the Guildford Borough who had attained 11 years of age. The school was co-educational. The reason for the selective entry was due to a condition laid down by the first Headmaster, C. Ellerton Nicklin, M.A. in accepting his appointment. C. Ellerton Nicklin was an active Conservative Councillor in the town and became Mayor of Guildford and subsequently an Alderman of the Borough. 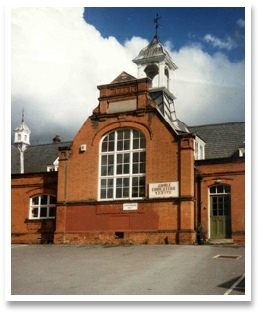 The School had two-form entry per year with approximately 32 pupils per form. The school had in total roughly 30 pupils swollen to some extent by the addition of pupils from the Elliot Central School which returned to London after the war. The school provided Commercial and Technical courses. Pupils at Guildford Central School could obtain the Oxford School Certificate with exemption from London University Matriculation if marks warranted. Any pupil requiring higher education e.g. Higher School Certificate could only obtain this by attending the Guildford Technical College. Although major changes brought about by the 1944 Education Act did not become implemented until around 1948. In 1945 the School changed its name to the Pewley County Secondary School. The School eventually moved to Burpham under the new name of the George Abbot School. This was a relatively small school of around 100 pupils catering for children from the ages of 5 - 11 years. Pupils who failed to pass the entry examination to the Guildford Central School or one of the few free places either at the Guildford Grammar School or the County School for Girls, were then transferred to Holy Trinity or some other Elementary School. The School closed in the late 1940's with the growth of Pewley County Secondary School. In the early 1940's the Centre consisted of two schools: the Guildford Central School which occupied the buildings adjacent to and to the south of Harvey Road and Charlotteville School which occupied the centre portion of buildings facing Sydenham Road. 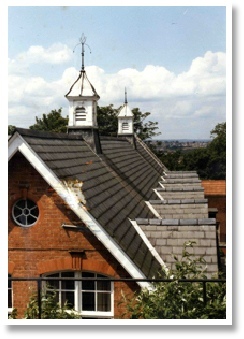 On either side of Charlotteville School were the two wings occupied to the east by the Woodwork Centre and to the east by the Cookery Centre. These Centres were not simply for pupils of the two adjoining schools but catered for many neighbourhood schools. These two wings were extended in the late 1940's or early 1950's.